We like to think that we love all the dogs in the kennels in equal measure: we try not to show favouritism; we try not to be ambivalent; we try not to let any of the dogs test our patience. It has to be said though that some dogs are just easier to love than others. Yukon was the easiest dog in the world to love; he was so gentle, so sweet; over the course of his short 16 months with us he never once did a thing wrong. It therefore broke our hearts when we were forced to play god at 0515 am on 15 October 2009 and bring to an end the misery, the pain, the sickness and the wasting away that Yukon had been suffering for weeks but had never once complained about. We both cried so deeply that this special guy had been taken from us at such a young age and before we had even really got to know him fully. 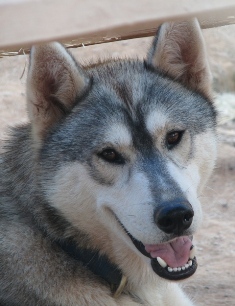 We never once had a cross word with Yukon, he was the perfect companion: so, so sweet, gentle, polite, patient. Never demanding, not even at meal times, always waiting his turn, always willing to share. He was a very handsome and promising athlete; I had already begun making plans for how we would integrate Yukon and his half-brother Dawson into the main team; plans that will never now come to fruition. Yukon was on good terms with every dog in the kennel: he had no hint of aggression or dominance, he wasn’t possessive, never demanding nor pushy. On what turned out to be his final morning at home, the now house-bound Yukon lead me first to ‘his’ pen to see Hektor and Paris, the mentors and companions to he and Dawson since the day they had arrived from the UK; as usual he managed to wag his tail at them despite his weakened condition. Then he took me along the front of all the other kennels: every dog without exception came forward and stuck their noses through the fence and wagged their tails in greeting to Yukon. We stopped at the final pen containing Reb, Terror and Jim, and it struck me as odd, yet very touching, that these normally boisterous, noisy and domineering adolescents, were displaying such warmth towards another young dog. All the dogs, without exception, liked Yukon. At the time, already burdened with great sadness for what I felt was to come and as a result of the restless nights behind us, I fought back tears trying not to think that what I was witnessing was Yukon saying goodbye. But at the time, and even more so looking back now, I think Yukon knew it was goodbye and he wanted his time to bid farewell to his kennel mates; it was only Louise and I that couldn’t face up to reality. And so after visiting all the other dogs we returned one final time to see Hektor and Paris and then we trudged slowly up the hill towards the house, the van, the vets and eternity. And in reality this was Yukon saying goodbye. That night Louise and I had too few private moments with Yukon to say our own goodbyes. We had some hopes that the surgeon would pull off a miracle and we would see him again, and that soon enough he would be back with us, fit and healthy once again. We both knew however that it was possibly a forlorn hope; and we were right, within 36 hours Yukon was taken from us. Yukon was far too young to leave us and we would have done anything to have him here with us today. But he was also too much of a sensitive, special dog to subject him to more pain and suffering just so we could feel better for a few days more. That first night that Yukon was gone, Dawson came into the house and looked around for his brother; over the last week Dawson had been spending all of his time in the house, keeping Yukon company in the vain hope that his presence would aid recovery. With Yukon gone Dawson was disturbed for days afterwards: crying into the lonely nights, the first nights of his short life that he had been apart from Yukon. Everytime we have managed to force Yukon to the backs of our minds, Dawson’s sorrowful, lonely crying has brought him back into our conscious thoughts. Even now when we go into the pen Dawson looks lost and alone; part of him is missing. The one thing that could make Dawson whole again will never come back. We all miss you so much Yukon and we're so sorry that we failed you.